I had this ball of STR saved from May 2010. I tried (and failed) to make the club sock that month. The yarn seemed boring and lackluster, too pale. 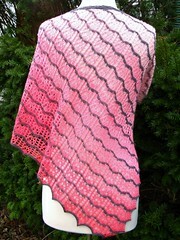 But, oh how this “spirit” colorway shines in a mostly-stockinette shawl! Ashton is a great pattern in it’s own right, but the designer makes it even better by intentionally making it accessible to the beginner lace knitter. 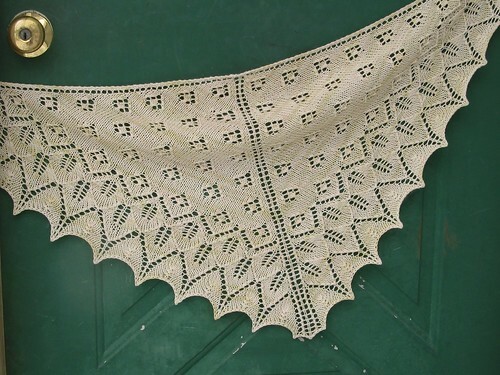 A thoughtful step-by-step process leads a novice lace knitter through the process of reading charts to make a traditional top-down triangular lace shawl. I have, in fact, already recommended this pattern to a friend and a knitting student. I did do one repeat less than the pattern called for, because I knew I was working with a smallish skein. I ended up with 6g left after the bind off. Success!